Welcome back to Comics From Yesteryear, fanboys, where we remember the stories that put the “comic books” in “Well, it makes more sense if you read the comic books…” Speaking of comic properties appearing on screen, how is it that Agents Of Shield is a TV show, but Damage Control isn’t? And yeah, I know, I’ve heard it: “Agents of Shield got good after the first 30 episodes, you just need to stick with it!” I get it; everyone who watches that show thinks they deserve a medal or something. The point is, Damage Control as a mockumentary style show a la The Office or Arrested Development would print its own money. Get on that, Marvel. 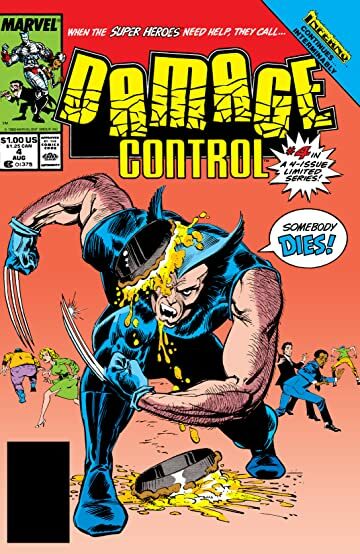 Damage Control (volume 1) is a four-issue miniseries from 1988 that is composed of 4 self-contained issues telling the tale of Damage Control, the agency that cleans up the disasters left behind in the wake of super-powered confrontations. 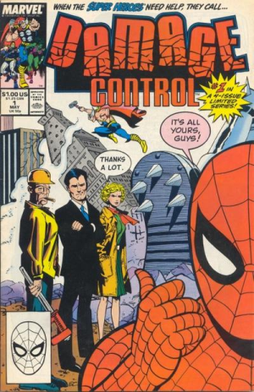 Created by Dwayne McDuffie and Ernie Colon, Damage Control’s staff is made up of John Porter (account executive), Robin Chapel (traffic manager), Albert Cleary (comptroller), Lenny Ballinger (head foreman) and several others who constantly manage to get in over their heads in a world of heroes on a regular basis. The introductory issue of the series opens with John’s first day on the job and his getting the layout of the company and his coworkers, some of whom are happier to have him on board than others. It’s not long before he’s given his first assignment: clean up a massive robot sprawled across Manhattan after having been deactivated by Spider-Man and The Avengers, even while Spider-Man is trapped in the machine’s skull. Along the way, John makes friends with the Wrecking Crew villain Thunder Ball, Robin and John put aside their short-lived professional rivalry, and Lenny rebuilds the World Trade Center towers (which is somewhat awkward to read nowadays, I can assuage that by reminding you of how old we all are: this book came out in 1988, which means it was released closer to the events of 9/11 [a thirteen year difference] than the current day is [a fifteen year difference]. You’re welcome for that). Issue two focuses more on Albert’s role as comptroller working with DC’s intern, Bart Rozum, as they visit Dr. Doom’s embassy to collect on unpaid bills before the company will fix a building he owns that has been turned to glass. It’s definitely my favorite issue of the series for the concept alone (and, for my money, it has easily the best cover), and has a coinciding bit with John trying to help The Thing convince the Fantastic Four’s insurance company to cover their new members. The third book in the series guest-stars The Invincible Iron Man, and sees the head of marketing, Henry Ackerdson, trying to improve Damage Control’s visibility and public perception through an exciting new ad campaign. This involves a team of corporate office workers and construction crew members to don “superhero costumes”, complete with capes, and hand out talking stuffed mascot toys. Compounding things in this one, errant directions by Henry have sent an underground drill team pushing straight into the Hudson River, threatening to flood Damage Control’s office. And in the last issue of the series, the crew visits the destroyed X-Mansion to investigate how it is managing to steal supplies from nearby hardware and lumber stores. At first, only John can see the mansion for the pile of debris it is—the others all see the school in its former glory—which leads to a flashback of the time they had visited the X-Men’s home previously and were mind-wiped by Professor Xavier when they ran afoul of the heroes’ Shi’ar technology. That tech has been corrupted by a set of comedy tapes installed by Kitty Pryde and Doug Ramsey, and the X-Men and Damage Control are assaulted by Danger Room versions of Groucho Marx, the Three Stooges, and others. This series held up better than I thought it would. McDuffie managed to rely on a lot of one-liners and entertaining back-and-forth dialogue rather than dated references, so if not for how much the Marvel Universe itself has changed over time, I’d be willing to buy that this was a current title. Damage Control is an idea that Marvel has gone back to the well on for story arcs like Civil War and World War Hulk (the former of which bastardized the original concept of DC as a good-natured, humorous entity by revealing that a rogue Damage Control employee [no one from this 80’s series, thankfully] was in part responsible for the deaths in Stamford, Connecticut that led to the inter-hero conflict), and I’d personally be interested in a return to the crew at this point. There were two other limited series that followed this one that I have not gotten my hands on yet, so I will probably just have to settle for finding those someday. +There are some funny lines of conversation in these books. Stuff like “I could use a tech team down here… one of my men just had an origin”, “Here’s the thing – are you writing this down? Good. You… Guys… Are… Morons”, “Oh. [Dr. Doom] owes us some money and our friend went down to collect”, “Wow! Can I have an autograph? … Not yours, I meant one of the real ones”, and others (heck, the ones I cherry-picked there were just my favorites from the first two issues) got a laugh out of me. +Hey, I dug the art in this one! It’s exaggerated at points, but it really fits the mood of everything. And when Colon puts work into panels instead of leaving them bare-bones for humor’s sake, he’s actually a very competent artist. Also, Wikipedia tells me that Mr. Colon did a graphic novel based on the 9/11 Commission Report, so… there’s that. Wow, two references to September 11th in one review of 1980’s silly comic Damage Control; my mother was right, I CAN do anything. -It’s really hard to give anything here a real thumbs down; not that the series is a 10 or anything, but it’s a four issue funnybook that just sets out to tell some irreverent stories and succeeds at it. It’s funny, it’s not too lowbrow, and it holds up well. It’d be really nitpicky to hammer this series on anything, but I guess you could say that the humor might not be for everyone; it’s goofy and relies on a lot of wordplay. I thought it was a blast to read, but others might think it is a little too absurd or cheap. This was fun. The whole series is a breeze (I read through it twice for this column in about 2 hours or less). There are certainly less fun ways to spend your time… like watching Agents of Shield, for instance (I’m kidding, I’m kidding! Calm down and put the torches away, guys). I’ve added volumes 2 and 3 to my “Try To Find” list in the hopes that they pick up where this one left off; if and when I do, hopefully I’ll remember to cover those for you guys, too. Until next time, keep readin’! Nice review.. Would love a TV Show as you had described it as well!